So, there are about a billion things on this bank holiday weekend. We’ve picked out just a couple of things for you to consider doing, if you can navigate your way around the NATOPOCALYPSE that nonsensical fence is causing. Gethin Russell-Jones signing copies of ‘My Secret Life in Hut Six‘, which tells the story of Gethin’s mother Mair, a musician brought up in the Welsh valleys, who ended up in Bletchley Park deciphering codes during the war. Mair wrote this book alongside her son and died on 28 December 2013 aged 96, shortly after it was completed. The book signing takes place at The Olive Branch bookshop from 12:00 midday to 2pm. A celebration of the opening of the second phase of ‘If This Is Nowhere’; a new video installation by Tom Crawford. This will be preceded by a reading group in the Collective Studio at 4pm – participants will be invited to read from a selection of texts, coming together afterwards to discuss, compare and debate their themes and arguments. 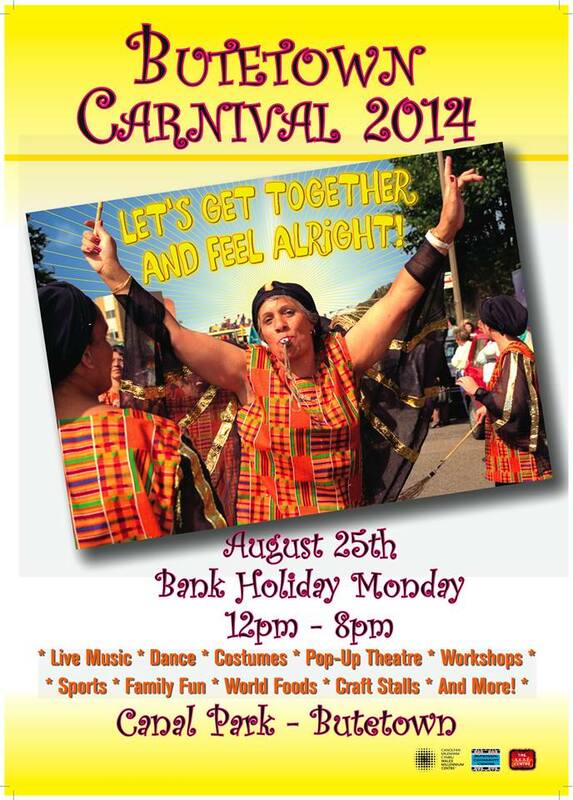 Riverside Community Festival will have lots of FREE activities for children and families. There will be food, live music and performances, information stalls, music, art and dance workshops, Circus skils, Face painting, Henna Artist, PCSO bike marking scheme and lots more. HUB Festival returns this Bank Holiday Weekend with a whole host of great music and performers! 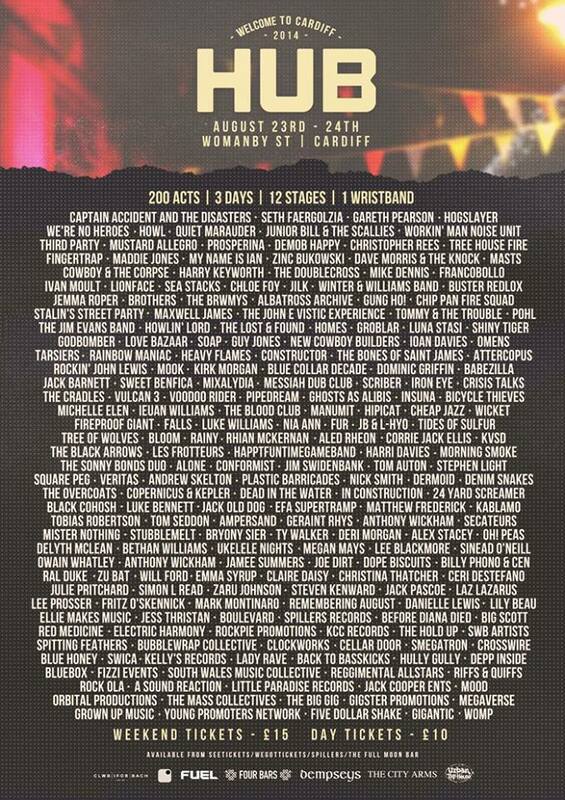 150 Acts, nine venues, one wristband. £10 Day-Tickets / £15 Weekend Tickets. Pretty nuts, eh? Just look at the line up! 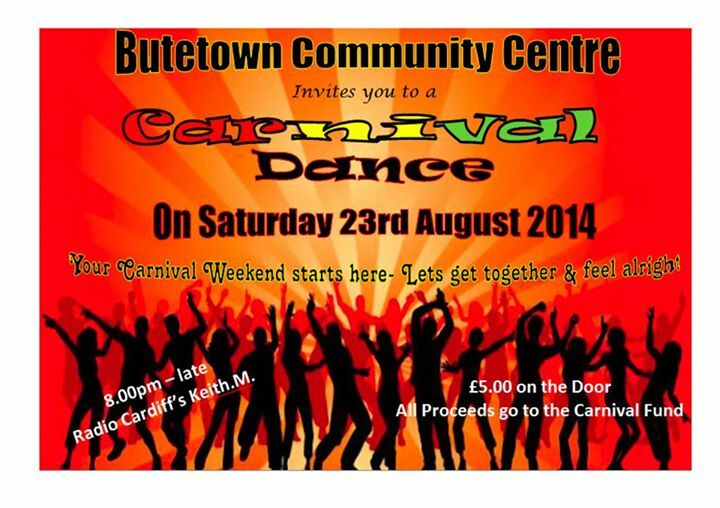 Read our post about the Butetown Carnival, and get yourselves down there! A fun day for all the family! An event for all ages, with live music, art, refreshments, children’s and craft workshops, stalls from local and nationally recognised businesses and lots of fundraising games. There’s also lots of activities for children of all ages with Glitter Tattoos,Glitter Bugs Face Painting, Twist and Turn Balloons, Mini-miss Makeover-parties an XBOX tournament, Graffiti Station, Cupcake Decorating, Music workshops and Totsplay classes. Also a demonstration by Ash Randall and Tom ‘Conman’ Conners of their World Record winning football and basketball freestyle. All this plus many fundraising stalls for Oxjam Cardiff with loads of prizes to be won, fun to be had and money to be raised for Oxfam.